In today’s global business environment, the aftermath of a contract dispute can mean the demise of a company or business unit. The legal contract translators at 24 Hour Translation are trusted by leading law firms and fortune 500 businesses to translate important contracts and other matters of significant legal consequence. When it comes to the legal translation of contracts, it is imperative that you hire an experienced legal translation firm with experienced legal translators. The legal translation team of at 24 Hour Translation can be trusted to translate the precise meaning of a contract before a second translator proofreads the contract to double-check for accuracy and readability. Taking shortcuts and hiring inexperienced translators can lead to misinterpretations and disputes concerning the exact terms of the contract. Even when an experienced translator is hired, the contract may not be translated completely and arguments can arise when certain terms are read into the contract, or implied. Based on the country, courts may be unwilling to amend agreements, or may only do so under special conditions. In some countries, the terms might be implied by statute. In any event, such problems can strain relations or be detrimental to business. If an incompetent translator is hired, or if the translator does not take the time to be thorough, and the translation company does not proofread the contract, there may be ambiguity in the wording. These types of problems often involve how the different parties to the contract interpret the meaning of particular terms. Different courts place different weight on literal meaning and intended meaning of words and phrases, while other countries interpret the contract in light of all factual circumstances. Many times, these types of problems can easily be avoided by choosing a trusted legal translation company. 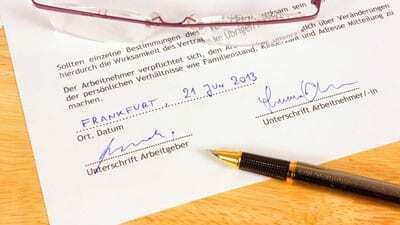 A contract with translation flaws can also be set aside by the courts if it is found to be defective. The events that cause a document to be judged as flawed are often called vitiating factors. An example of a vitiating factor is when one party has been misled into entering into the contract due to false claims or misrepresentation. In some instances, certain translation mistakes can be viewed as misrepresentation.